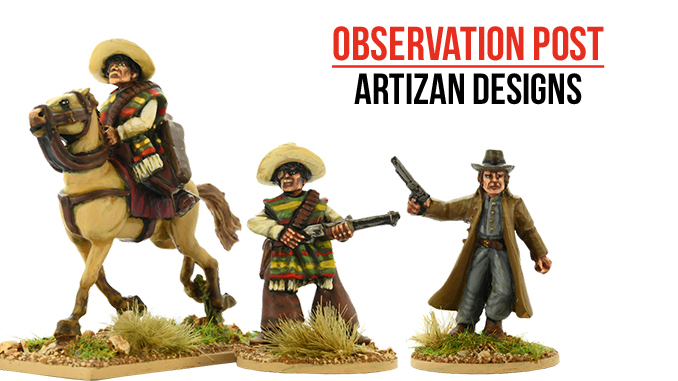 Artizan Designs have added yet more characterful miniatures to their Wild West range. This time, we have mounted and dismounted versions of the same Mexicans and more gunfighters on foot. The Mexicans are available in a pack which consists of one mounted and one dismounted version of the same character. Each figure is sculpted by Mike Owen in his usual characterful style, influenced by film and TV and filtered through the imagination of this excellent sculptor. There are four separate Mexican characters in this particular release, which will no doubt be given suitably Wild West names upon their final release. They would make a great core for a gang of Mexican banditos or revolutionaries. The second release consists of three ‘gringos’ in the so-called ‘duster’; the long, trenchcoat-like coat worn by many hard riding men in the Wild West (or so the movies and TV would have it). Once again, these are characterful sculpts, crying out for some careful painting and a faded, travel worn effect on the coats. The trio includes a character with matched pistols, one with a single revolver and the last with a repeating rifle. As we’ve come to expect from Mike Owen Artizan Designs, these are the types of figures that stand out as both individual characters and a suitably diverse ‘posse’ on the tabletop. As always, these figures will be available from North Star, who cast and distribute them on Mike’s behalf.